THIS intermediate hurling championship final replay success at Netwatch Cullen Park on Saturday will be a sweet one for the winners. You can go back as far as 2006 when Rangers won their first senior title, after the Myshall side had won the year before, to find the point when the hurt truly began. 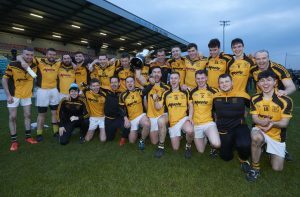 Since then, St Mullins have won their fair share of senior crowns, but by and large it has been Rangers who have dominated where once Naomh Eoin prospered. Many of Rangers’ successes have been achieved at the expense of Naomh Eoin. So Saturday was some level of payback for previous disappointments. The eventual winners got off to the best possible start when Keith Hogan was on the end of a passing move involving Gavin Ruschitzko and Martin Clowry to fire over a point on 48 seconds. Two minutes later Hogan found the net as Naomh Eoin dominated at midfield putting pressure on a stretched opposition defence. A Derek Byrne free got Rangers off the mark but Kevin Hosey cancelled that out with a placed ball of his own. When a Naomh Eoin free was brought forward, their goalkeeper Damien Jordan came out and fired the sliotar over the bar. Naomh Eoin looked in control but they were hit on the break when John Coady latched onto a pass down the left, beat his marker and picked his spot in the top right-hand corner at the O’Hanrahan’s end of the ground. Typical Rangers. After living on scraps they were now back to within two points of their rivals and very much in the game. If Naomh Eoin had doubts about their own ability they dispelled them with points from Hosey and Johnny Murphy. The created one goal chance but Hogan’s pass to an unmarked forward in front of goal was intercepted by the Rangers defence on 15 minutes. Six minutes before the break Naomh Eoin led by five points as Rangers had Derek Byrne sent off for an off-the-ball incident. The 14 men reacted well to their misfortune and David Grennan landed a free and a 65. In response, Ruschitzko and Hogan landed two good points from play to leave Naomh Eoin leading 1-8 to 1-3 at the interval. Five points in a game of hurling is not much and Grennan’s 31st-minute free narrowed the gap even further. Naomh Eoin lacked adventure in the second half and seemed to slip into ‘hold what we have’ mode. They should have turned the screw, especially when Hosey and Eanna Kavanagh picked off a point each in the third quarter. Instead Rangers hit back with points from Grennan and Darragh O’Toole. 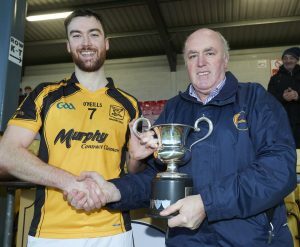 Myshall hearts raced when John Coady got inside the Naomh Eoin defence and with Jordan racing out of goal the canny full-forward saw his shot slip just outside the right-hand post. Shortly after that, on the advice of an umpire, he and Declan O’Brien picked up straight red cards. It was a loss Rangers, in particular, could have done without. Hosey scored a great point after picking up a loose ball and shooting over from 65 metres. It looked as if it was Naomh Eoin’s to loose. Five points up once more, that should have been that but Rangers never gave up. Two Grennan points in the closing stages narrowed the gap to, from a Naomh Eoin point of view, a scary-looking three. Rangers came strongly at the end but without two key men their attack was blunted and Naomh Eoin saw out the game to be crowned champions. Naomh Eoin: Damian Jordan (0-1 free); Donal Jordan, Shane Cranny, Johnny Murphy (0-1); Michael Kavanagh, Eoin Doyle, Philip Smithers; Donal Smithers, Anthony Hogan; Eanna Kavanagh (0-1), Declan O’Brien, Keith Hogan (1-2); Gavin Ruschitzko (0-1), Martin Clowry, Kevin Hosey (0-5, 0-4 frees). Subs: Patrick Mullins for Clowry (51 mins), Pauric Slye for E Kavanagh (61 mins). Mount Leinster Rangers: James Kavanagh; Jack Ryan, Garry Doyle, Daniel Ryan; James Quinn, Dara Tobin, Eddie Coady; Tony Lawlor, David Grennan (0-6, 65, 0-4 frees); Luke Roche, Conor Fenlon, Derek Byrne (0-1 free); Rory Joyce, John Coady (1-0), Bernard Scully. Subs: Shane O’Neill for Quinn (24 mins), Darragh O’Toole (0-1) for Joyce (h/t), Donald Coady for Fenlon (50 mins), Eoin Fenlon for Scully (54 mins).